I'm working on a platform-agnostic game development tool called Exploding Editor. I started making it for my own use but a few people told me they were interested in using it after I showed it to them. I am trying to figure out if there is interest in a tool like this. I could not find a similar tool, so I am wondering if maybe there is one and I just couldn't find it. Exploding Editor is used to generate data for game developers, and then you can use the data in any game engine. I'm using it with Unity for my own project. Its most unique feature is palette editing/animating, but it also has integrated sprite sheet slicing, a tilemap editor, and animation tools. I also may add the ability to create general purpose data and a basic entity/component system data model. Please let me know if you are interested in a tool like this and what kind of features you are interested in. It is sort of like a barebones version of Unity without the game engine part that is geared towards 2D development. I personally like having my data separate from the engine I use, but not sure if others feel the same way. So I guess you could think of it like Tiled... how Tiled generates a tilemap xml file that you read into your game. Exploding Editor does the same thing but it doesn't only create data for tilemaps. It also generates data for things like palettes and animations that you can use in your game. I'm interested. I've also looked in the devlog and I think that this is cool. 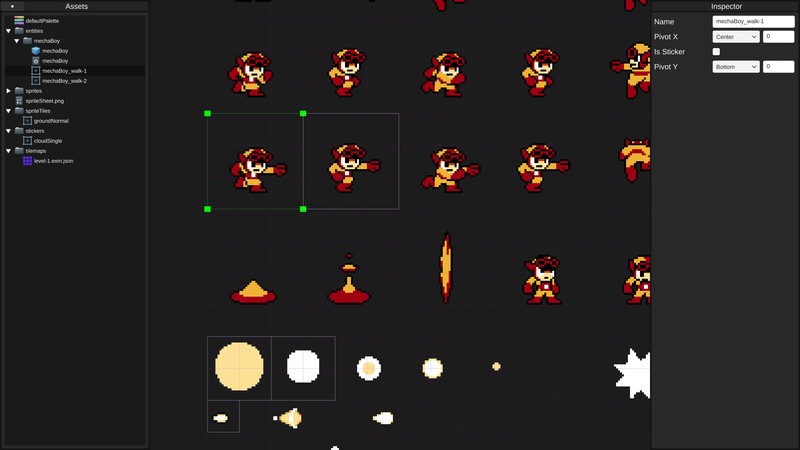 Can it also create sprite sheets by combining different images? I think it would make sense to add that feature. I'd also need to export an additional data file that would tell you where all the sprites are on the packed sheet. It would get more complicated if all packed sprites don't fit on a single sheet, so I may only allow a single sheet in the first version.